Western Digital designs every system or hard drive to serve a purpose. Since 1970 Western Digital has an industry leader in specialized hard drive and network attached storage (NAS) technology. Now they have grown to be the global leader in all storage technologies specializing in cloud storage systems, internal hard drives, and NAS systems. Other Features: Intuitive management dashboard, backup and sync (multiple options available), My Cloud OS, Milestone ARCUS surveillance software, file sharing, and streaming. Requires DLNA/UPnP or Plex devices for streaming as well as an internet connected router. 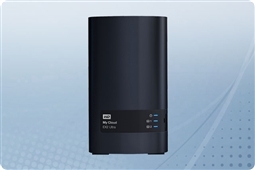 All Aventis Systems is proud to offer our Western Digital My Cloud Expert EX2 NAS systems with a comprehensive 1 Year Essentials warranty with optional Secure Drive, Extended, and Express warranty upgrades available. So shop below for for the simple, small business friendly professional data backup and storage device with the Western Digital My Cloud Expert EX2 from Aventis Systems!